Great news…on Facebook I labeled a photo of the white squirrel “long way from home”. 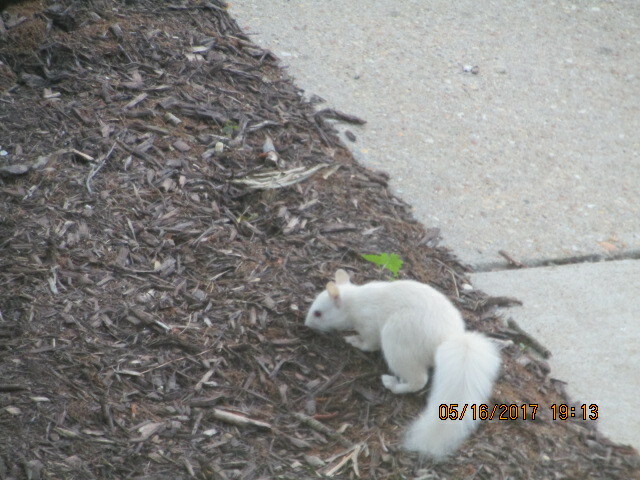 I was wrong, that is not the white squirrel that reside and play near the front gate of Imperial Plaza. This is a second squirrel that now reside at the rear of the Boxwood apartment building. It is great to see another squirrel because there was three when I first moved here and all three died (one became hawk food, one was hit by a car and the other disappeared). I hope our hawk family doesn’t take it for lunch. Thinking about the hawks, I am awaiting the sighting of the young ones. 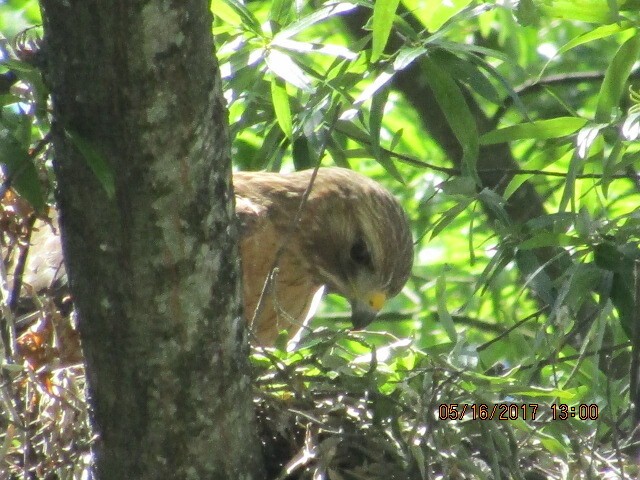 They should be getting large because the female hawk is on the rim of the nest most of the time and I seldom see the male. If I can get pictures of them learning to fly I will share them on my Facebook page. It should be soon. I have included a couple of pictures of the female on the rim of her nest. The Wednesday bus trip to the Virginia War Memorial was good. Since I have been there many times as part of the Mighty Pen Project, I ended up being an unofficial guide for some of the attendees although there are people there that gives good information. After the Virginia War Memorial, we ate lunch at Lewis Ginter Botanical Gardens. All I will say about the food there is that it was not what most of us were used to eating. The menu was geared mostly toward the vegetarian, of which I am not. Although it was very cloudy, wanting to rain, the rain held off and all was good. My wife and I spent last Friday and Saturday at the great grand son’s naming ceremony. Had a great time, the baby never cried and he stayed awake much longer than usual. After two days in northern Virginia, my wife and I kept going to Maryland Live. We were to come back to Richmond on Monday but the weather forecast indicated pouring rain. We decided to stay an extra day and return when the roads were dry. WRONG! It drizzled rain Tuesday morning but it was mostly dry. But, the trip wasn’t wasted because I returned with a small profit. We made it back in time to go to the White Squirrel for dinner, enjoying Eugene’s singing and, of course, dancing. The only complaint I have with the White Squirrel is it is always out of regular beer. I guess the reason is there is always lite-beer that no one want. There are many other places for us to go but most people here do not drive and is stuck with whatever there is here. Shame. Well, the warm weather has been gone for a little while and will remain gone a while longer. I would call it a wake-up call to let people realize that Mother Nature will do what she want when she want to do it. It’s chilly but, I’ll make a huge bet, in two or three weeks everyone will be crying for it to be cooler. People are never satisfied, I guess. Enjoy Memorial Day weekend. Be careful. Be vigilant! Have fun! Remember those that served and are presently serving brought America to where it is now and is keeping our our way of living secure. This weekend is not a weekend of celebration but a weekend of remembrance. God bless the USA and the troops that keep this nation free.